Comments: Samuel R. Gault stands in the lower right corner of the Scottsville Ferry on its last crossing of the James River in 1907. 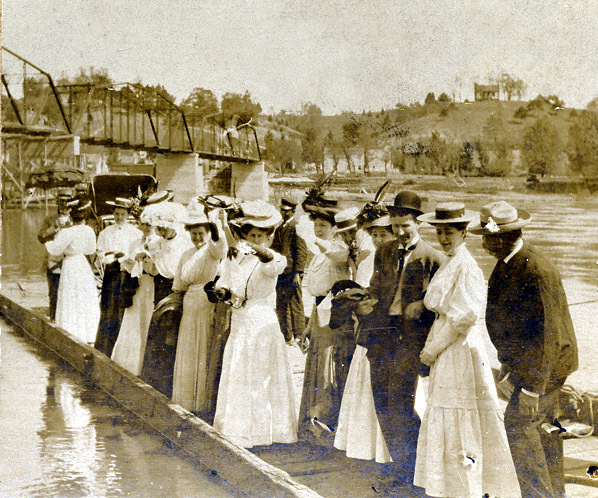 The new bridge, which made the ferry obsolete, is shown behind this group of young men and women as they enjoy their last ride on this historic ferry. This ferry had been in operation since 1745 when Daniel Scott, son of Edward Scott, was commissioned to build it here on the James River at a place known as Scott's Landing. In 1732, Edward Scott patented 550 acres of land here on the upper northwest curve of the river's Horseshoe Bend. His estate sat between an old Indian ford and the mouth of the Totier Creek. This ford was the only breach in a six-mile barrier of bluffs along the north side of the James and provided a natural landing place for James River boats to off-load goods onto wagon for transport to the north. When Virginia established Albemarle County in 1744, county organizers selected Scott's Landing to be Albemarle's first county seat. Indeed Scott's home may have served as a temporary courthouse until a permanent one was built on a hill about a mile east upriver. Albemarle Co. magistrates commissioned Edward's son, Daniel, to build a ferry at Scott's Landing. It would facilitate travel to the courthouse from the part of Albemarle Co. lying south across the James River in today's Buckingham County. Early travelers on Scott's Ferry included Thomas Jefferson, who often crossed the James River on the ferry to visit his brother, Randolph, at Snowden. Snowden was Randolph's home that sat on a high bluff overlooking Scott's Landing from the Buckingham side of the river. In those years, the town also was known as Scott's Ferry, and eventually in 1818, the Virginia Assembly incorporated the communtity as the Town of Scottsville. Thus this 1907 closing of Scott's Ferry marked the end of 162 years of rich Scottsville history and the beginning of a new era in transportation.